The Fixing America’s Surface Transportation (FAST) Act gives the State Department the ability to revoke or deny a passport to taxpayers who owe $51,000 or more. No passports have been revoked so far, but passports applications have been denied, and more than 200 people have resolved their tax debt. The FAST Act does provide some exemptions for hardship, taxpayers who have asked for an installment plan, and pending offers in compromise. Almost everyone knows that failing to pay their taxes can result in serious consequences, but few would imagine that tax debt can restrict their ability to travel. Well, many people are now facing this reality, as more than 360,000 Americans with tax debt may be denied passports. The State Department has the ability to revoke the passports of citizens with a certain amount of tax debt, which means you could find yourself without the ability to travel to other countries if you fail to pay your taxes. Learn more about losing your passport because of tax debt and find out how you can rectify this serious situation. In 2015, the Fixing America’s Surface Transportation (FAST) Act was signed into law. This law granted the IRS and the State Department the ability to deny a passport or revoke a passport for taxpayers with seriously delinquent tax debts. Seriously delinquent debt is considered $51,000 or more, and this threshold includes penalties for late payment and any accrued interest. 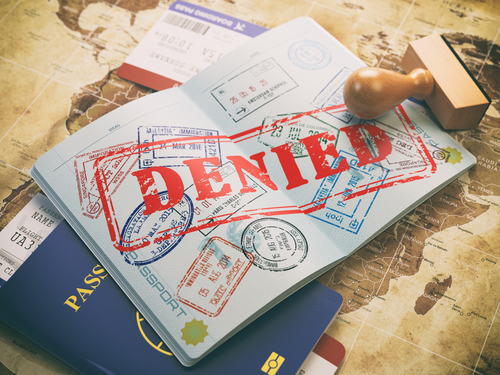 When the FAST Act was written, it was imagined that rejecting a passport application or denying a renewal would be the most common penalties, although complete revocation of a passport is possible in the most serious circumstances. Although the FAST Act was passed in 2015, it is just now being fully implemented. The IRS is now frequently sharing information about delinquent taxpayers to the State Department, and the agency has estimated that completion of its efforts will take place by the end of the year. While the FAST Act and its punishments are certainly not without their detractors, the law is already seeing big results. A report by the Wall Street Journal revealed that almost 220 people have resolved their tax debt because of the FAST Act, resulting in the IRS collecting $11.5 million. In fact, one taxpayer paid $1 million in back taxes to preserve their right to a passport. An additional 1,400 people have agreed to an IRS installment plan so that they can apply for a passport. An important thing to understand about the FAST Act is that neither the IRS or State Department has stripped anyone’s passport as of yet. Currently, the only denials have been for passport applications and renewal requests. That doesn’t mean, however, that the agencies won’t revoke passports in the future. If you’re dealing with a large amount of tax debt, it’s important to get relief as soon as you can so that you can preserve your ability to obtain a passport. What Is Seriously Delinquent Debt? Now that you know about the FAST Act and how it can impact your ability to get a passport, it’s important to take a look at what counts as seriously delinquent debt so that you can understand your risk for this situation. One of the most important things to understand is that the $51,000 seriously delinquent debt threshold includes penalties and interest. So, even if your tax debt is $40,000, you could still be at risk for losing your passport rights if interest and penalties total $11,000. Debt is also only considered seriously delinquent if two conditions have been met. First, the IRS must have exhausted all of its administrative remedies to collect the debt and sent the taxpayer a federal tax lien notice. Second, there must have been a tax levy issued. If both of these conditions have been fulfilled, your passport application is subject to denial until you have paid your back taxes in full. Fortunately, not every type of tax debt is included when calculating seriously delinquent debt. For instance, if you have agreed to an IRS installment plan and continue to make your payments on time, this debt will not count towards seriously delinquent debt. If the IRS has provided you with an offer in compromise, or if you have a Justice Department settlement agreement, and your payments are timely, this debt doesn’t count toward the threshold either. Like most IRS regulations, certain taxpayers are exempt from the FAST Act, meaning their passport application will not get denied even if they have seriously delinquent debt. First and foremost, if you are in bankruptcy proceedings, you’ll be exempt from these rules. Because bankruptcy does not discharge tax debt, these rules will apply to you as soon as you are out of bankruptcy. People who qualify for the IRS hardship exemption. Taxpayers who are in a disaster area designated by the federal government. Those who have requested an installment plan from the IRS. Taxpayers with an offer in compromise that is still pending. People with an adjustment to settle the debt that has been accepted by the IRS. Certain military members may also be exempt from this passport penalty. If you are a service member in the armed forces who is deployed abroad, the IRS will suspend these rules until you can return home and deal with your tax debt. When the IRS determines that you have seriously delinquent tax debt, it will send a letter notifying you of the situation. At the same time, a letter will be sent to the State Department notifying them of your status. If you have an open passport application, the State Department will leave the application open for 90 days to give you time to resolve the issues. In some cases, you may receive this letter as a result of an error, and correcting the error will fix the problem. If you actually do owe the money to the IRS, you have two options to prevent a passport denial. First, you can pay the debt in full if you can afford to do so. Second, you can request an installment plan from the IRS. If you’re dealing with a large amount of tax debt, Solvable is here to help you. On our site, you’ll find reviews of top debt relief companies that can help you resolve your tax debt so that you’re not at risk for losing your passport. Get started working on your tax debt today so that you can enjoy a debt-free future.